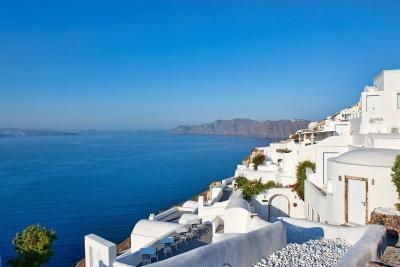 Lock in a great price for Canaves Oia Hotel – rated 9.6 by recent guests! I have been to many places in the world. But without a doubt this is the most magnificent accommodations, staff, view and Island. I just can’t say enough about everything. You literally won’t believe Your own eyes. The beauty is intoxicating. The staff will become your best friends and they are sincere loving and will educate you on many things. Shut out to Mr. John, Mina and Achés! I liked absolutely everything about this hotel! It was perfect in every way. Staff is super friendly- view is overwhelming - breakfast is super - room is very spacious and luxurious. What did I like? Everything! From pre-stay communication to the genuine "It was a pleasure to have you" as we left, the staff was beyond wonderful. The personal touch was displayed by everyone from the manager (Hi, John!) on down. The little unexpected extras made us feel so special. 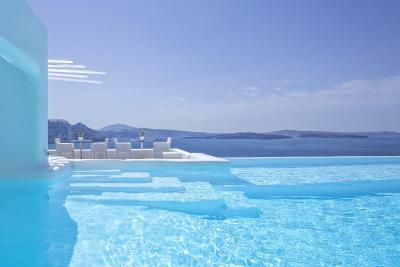 And the beauty of the hotel and Santorini are not to be beat. Will definitely stay here again when we return to this beautiful island! Everything here was amazing. The facilities, the location, the staff, the food. Could not be happier and can't wait to go back. Everything. The entire staff called us by our names once they all met us and were so helpful and kind. 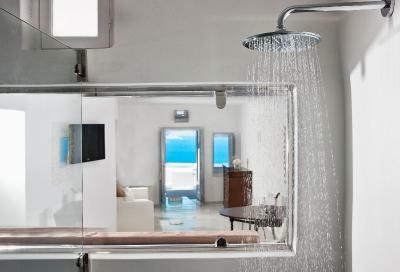 Truly a luxury, once-in-a-lifetime experience. Excellent staff with great location and facilities. Beautiful location and wonderful staff. We got an upgrade to a two bedroom suite which allowed my daughter to have her own room. The view from our patio was amazing and it was very private too. Each member of the staff was very friendly and made every effort to ensure we had a great stay. We felt very pampered!!! 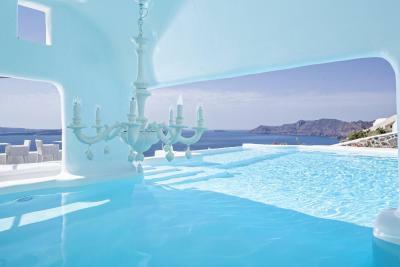 Canaves Oia Hotel This rating is a reflection of how the property compares to the industry standard when it comes to price, facilities and services available. It's based on a self-evaluation by the property. Use this rating to help choose your stay! 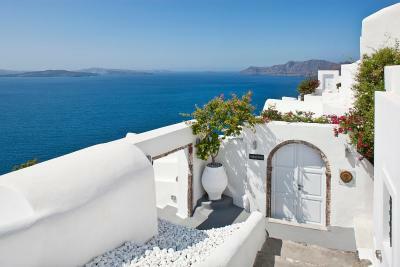 Built on the side of a cliff overlooking the Caldera, Canaves Oia Hotel features elegant accommodations in spacious suites and rooms. Free Wi-Fi is available in all areas. The facilities showcases an outdoor pool and private parking. 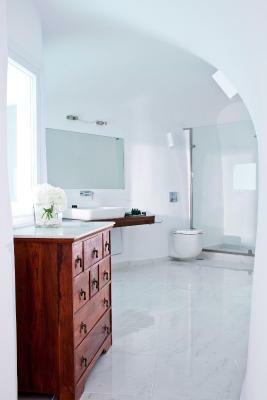 With Cycladic-style architectural elements, all units at Canaves have antique furniture and art objects. 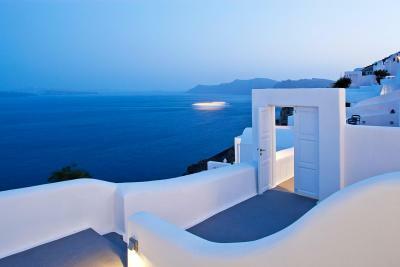 Each opens to a balcony with Caldera, volcano and Aegean Sea views. A flat-screen TV with satellite channels is included. Guests can enjoy light meals and refreshing beverages from the snack bar, and relaxing at the lounge chairs by the pool. 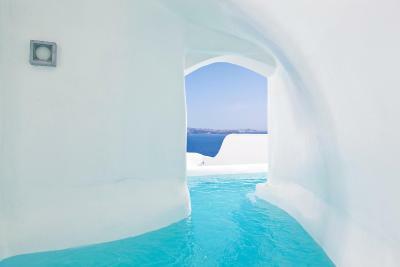 The hotel guests have access to all facilities and services of Canaves Oia Suites, 250 feet away, featuring a sit-down, gourmet restaurant and a wine cellar. The scenic Fira Town is 7 miles away and Athinios Port is 12 miles away. 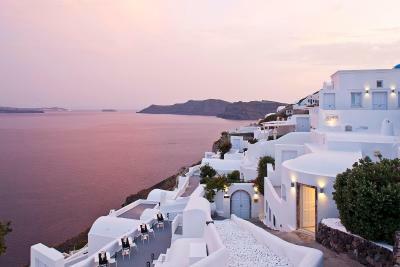 Santorini National Airport is 10.5 miles from the property. Free private parking is available at a location nearby. 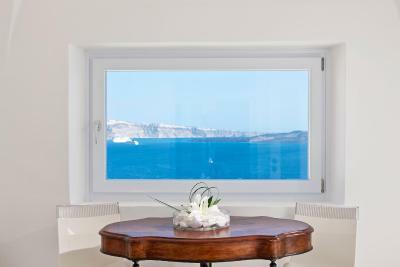 When would you like to stay at Canaves Oia Hotel? 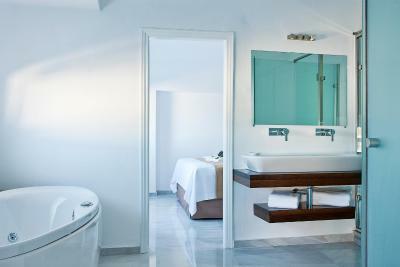 Featuring a separate living room with a dining area, a bathroom with a hot tub or hydro-massage shower and a balcony with Caldera, volcano and Aegean Sea view. Overlooking the Caldera, the volcano and the Aegean sea from its private balcony, this suite is elegantly decorated with classic furnishings and bright colors. 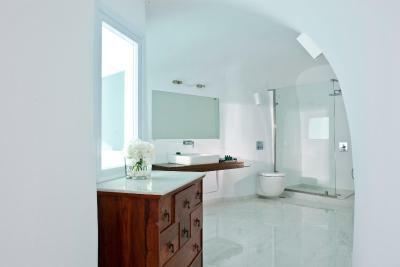 It has a separate sitting area and a private bathroom stocked with top-range toiletries. Its balcony features a hot tub. 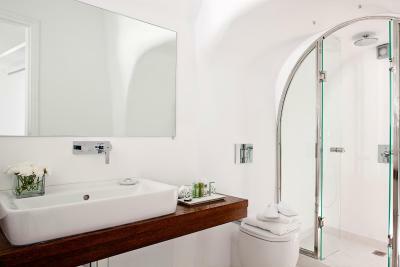 The property is built on the highest point of the cliff and this guarantees minimum to zero steps to the majority of the suites and the most panoramic views. 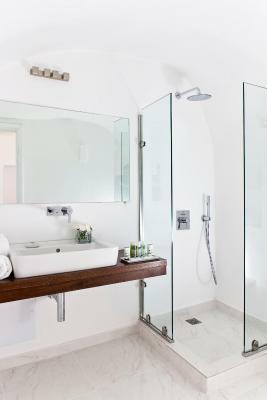 House Rules Canaves Oia Hotel takes special requests – add in the next step! 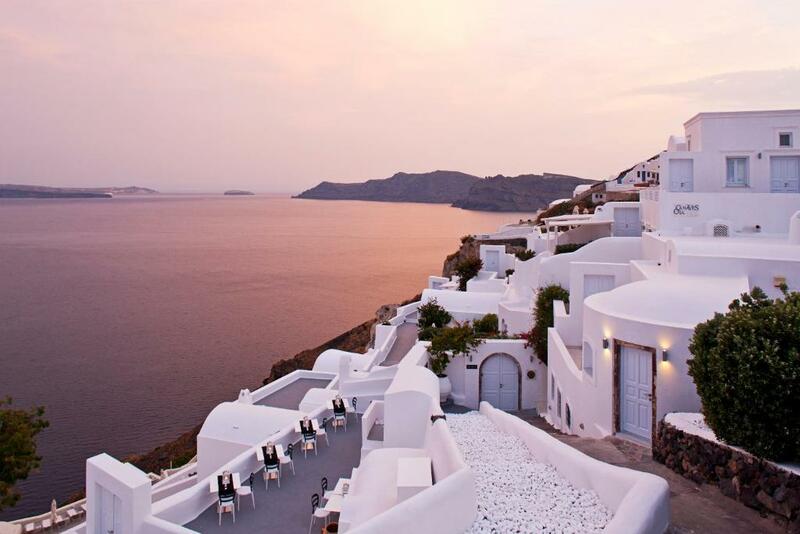 Canaves Oia Hotel accepts these cards and reserves the right to temporarily hold an amount prior to arrival. The hotel is amazing and what made our stay was John the manager who gave us some amazing recomendations and also upgraded us. John and the staff at oia Canaves made my birthday weekend very special and memorable. Thank you! Probably the most relaxing place in the world! That we had to leave. We did spend an extra day though that we weren’t going to but it was well worth it! Overall great hotel and this family run business is superb. The staff were all very helpful and they made me feel welcome and that they were there to make this vacay relaxing (and memorable). Also one random note but I liked their modern approach to hospitality. And I do think they have a modern approach to attract the right guests. I love that you login and rather than take you to a landing page you go to their curated Instagram. The hotel manager John personally showed us to our room and the hotel facilities.